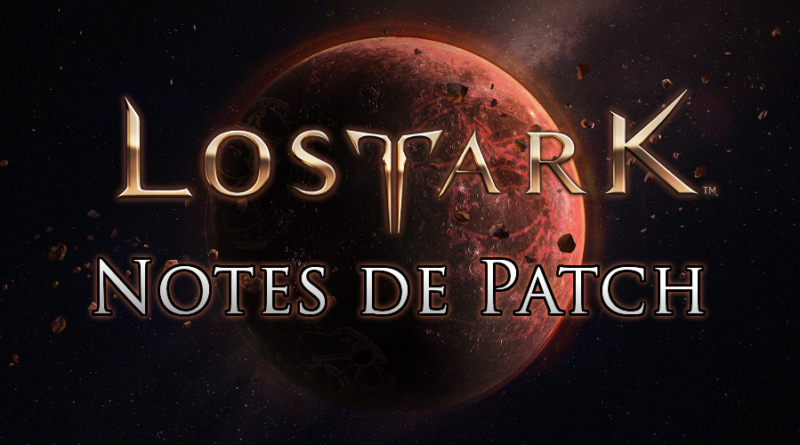 C'est une nouvelle fois une énorme mise à jour qui vient d'être déployée sur les serveurs de Lost Ark ! PVP has been adjusted to reduce the damage coefficient. As a result, all damage from other characters is reduced slightly. The next pet is not attacked by monsters, but has been changed so that it does not become an attack target. We changed the 'Stiffness' sentence effect as follows. Existing: Once every 30 seconds, if you deal physical damage, it increases your armor by 100% for 10 seconds and magic damage increases magic defense by 100% for 10 seconds. Change: Once every 40 seconds, you gain 100% DEF for 8 seconds and magic damage increases your magic defense for 100% for 8 seconds. We have shortened the delay time so that we can continue the next operation more quickly after the outbreak. We changed the 'shock wave' tripod effect as follows. Existing: After the attack, the rebound wave rises and gives an additional 20% damage twice. In addition, if your health is below 30%, additional damage will increase 100%. Change: After the attack, the shock wave will rise and give an additional 20% damage twice. At this time, if the target is abnormal, damage caused by shock waves increases to 40%. We have changed the 'Confirm Kill' tripod effect as follows. Existing: Combo attack is changed. The second attack deals 80% damage to the enemy and 25% more damage to enemies that are stranded. Change: The combo attack is changed. The second attack deals 150% damage to the enemy, but the cooldown increases by 6 seconds. Also, the delay time is shortened so that the next action can be continued more quickly after the second attack. We have changed the 'Power Accumulation' tripod effect as follows. Existing: The skill type is changed to the charge type, and it gives 10% damage for the first step, 50% for the second step charge, and 100% for the overcharge. Change: The skill type is changed to a charge type, which increases damage by 100% when taking 1st step and 250% when overcharging, but increases cooldown by 18 seconds. We changed the 'Whirlpool' tripod effect as follows. Existing: Revolves around using Winchim to attack the area around 360 degrees, and the damage it inflicts on the enemy increases by 30%. Change: Revolves around using Winchim to attack the area around 360 degrees, causing 50% more damage to enemies. Increased the base damage of the skill by 25.5%. Increased skill mana consumption by 11%. We have changed the 'Strong Strike' Tripod to 'Weakness'. Existing: The last attack increases 50% of the damage done to enemies who are immune to the attack. 'Storm Cut' When using the Tripod, we have shortened the delay time so that we can continue the next move more quickly after casting the skill. When the 'Leap' trepod is applied, the normal monster has been changed to move through. Existing: If your health is below 30%, damage will increase by 80%. Change: If your health is below 50%, damage increases by 80%. Skill preparation We changed the motion faster. Increased the standard damage of the skill by 49.6%. Increased the mana cost of the skill by about 25%. We have changed the charge time of skill as follows. We have changed the charge time of charge phase to be applied when applying 'Limit Break' tripod. The overcharge time of skill has changed as follows. Existing: Changed to [Fire] attribute, and if hit, it will make the image state for 6 seconds. If your health is below 30%, your damage will increase 100%. Changed: Changed to [Fire] property, and if it is hit, it makes the image state for 6 seconds. If your health is below 50%, your damage to the enemy increases by 100%. The effect strength of the skill has been relaxed. We have slightly reduced the range of additional hits when applying the 'Endless Attack' tri-pod. 'Emergency Recovery' sentence effect has been changed as follows. Existing: 2% of the maximum vitality is restored when using a mobile device. Change: When using a mobile, 1% of maximum health is restored. We changed the "punishment" sentence effect as follows. Existing: Each time the party member dies, the attack power increases by 5%, the chance of critical damage increases by 10%, and up to 3 times. This effect is initiated when a warrior dies. Change: Each time the party member dies, the attack power increases by 3% and the chance of critical damage by 3%, but up to 5 times. This effect is initiated when a warrior dies. Changed the "iron barrier" sentence effect as follows. Existing: Each time you are hit by an enemy, all damage taken for 2 seconds is reduced by 2.5%, down to a maximum of 40%. Change: Every time you are hit by an enemy, all damage taken for 2 seconds is reduced by 2%, reducing it by up to 40%. We have reduced the skill's range of judgment by about 20%. Reduces movement speed by 20% during skill casting. The effect of reducing damage during casting has been changed as follows. Reduced damage on PVP by 15%. Reduced damage on PVP by 30%. 1, 2, and 3 damage has been changed as follows. Changed to prevent initialization of cooldown cooldown on the battlefield of the Proof and Sila Mael Battleground. In the battlefield of provenance and Sila Mael battlefield, we have reduced the penalty time of the Geumgang lineup. PVP has been adjusted to reduce stiffness during holding attacks. Reduced damage on PVP by 20%. The "accumulated energy" tripod description has been changed as follows. Existing: You can not acquire ancient energy while holding, but if you hold more than 3 seconds for holding, you gain 80% chance to get 1 elemental bead. Change: You can not acquire ancient energy during holding, but if you keep holding to the end, you gain 80% chance to gain 1 elemental bead. Existing: Hold holding time increases to 4 seconds max. We changed the effect of 'Flame Pour' in the following way. Increased the base damage of the skill by 65.0%. Changed the 'Thunderous Light' tripod to 'Ignore Collision'. Ex: Shredi's attack hits an enemy with a 15% chance of 5 seconds of lightning. Change: Increases your movement speed by 10% during Shredi summoning, ignoring conflicts with normal monsters. We changed the effect of 'Shunde' tridod in the following way. Existing: Shredi's attack power increases by 30%. Change: Shredi's hit rate is increased by 50%. I changed the 'ignore crash' tripod to 'exhilarating light'. Existing: During the Summoner summon, the speed of your natural health recovery increases, and the collision with a normal monster is ignored when moving. Change: Shredi's attack hits every 7 seconds for 3 seconds, damages 3 times, causes big damage, and stuns for 2 seconds. We have changed the damage reduction width when hit on the outer part of the window as follows. Increased the base damage of the skill by 28.6%. Skill Skill Stack effect of the target has been removed to eliminate. According to stacking stacking, the damage of death fate skill has been changed to increase by 100%, 150%, 200% and 300%. We have changed to no longer be affected by the specialization option 'Increased damage of the skill'. Existing: Acquires 1 identity card with a 5% chance to hit. We have changed the 'strengthening concentration' tripod to 'stronger'. Existing: Spiral Edge Chain Hold Time increases by 3 seconds. Change: Spiral Edge is immune to a spike attack. We changed 'Piercing Strike' Tripod to 'Mind Focus'. Existing: Ignores 30% of the enemy magic defense when attacking. Change: Mana cost is reduced by 50%. We changed the 'unprotected target' tripod to 'capture weakness'. Existing: The attack rate is increased by 50%. We changed the 'continuous attack' tripod effect as follows. Existing: A combo attack is added one more time. Change: A combo attack is added one more time, causing the card to pour in the air once more, and the damage done to the enemy by the added combo attack is increased by 50%. We changed the 'exposed dark' tripod effect as follows. Existing: Changed to [Cancer] property, it increases 50% of critical damage received from you for 5 sec. Changed: Changed to [Cancer] property, increasing the critical hit rate by 40%, and increasing the critical damage by 5% for 5 seconds. Stack effect has been changed to apply to all hits. Changed 'QuickDro' Tripod to 'Gimmick'. Existing: Acquires 1 ID card with a 10% chance to hit the last attack. Change: A 10% chance that a skill does not deplete stacks. We changed the 'accidental blow' tripod effect as follows. Existing: A 20% chance of stacking stacks causes a 100% increase in critical damage done by a lane. Change: A 20% chance of stacking stacks causes a 200% increase in critical damage done by a lane. We changed the 'accidental striking' tripod effect as follows. Existing: No longer blows away, but deals 30% more damage to enemies and stuns for 3 seconds with a 20% chance per stack stack. Change: Increases the attack speed by 30% and stuns for 3 seconds with a 20% chance per stack stacking, while it no longer blows. We have changed the 'Quick-ready' tri-fold to 'Strengthened Strike'. Existing: When using the skill, the cooldown time is reset to 15%. Change: Increases damage done by Serendipity to enemies by 100%. The buff effect of the skill has been changed as follows. Existing: Increases your attack power by 5% for 150 seconds, and increases your party's damage by 15% for 20 seconds. Change: Increases damage taken by your opponent from enemies by 15% for 120 seconds, and your opponent's and party's damage by 15% for 8 seconds. Existing: Increases your attack power by 10% for 150 seconds, and increases your party's damage by 30% for 20 seconds. Change: Increases damage taken by your opponent by 120% for 15 seconds and 20% for 12 seconds. Existing: Increases your ATK by 20% for 150 seconds, and increases ATK by 60% for 20 seconds. Change: Increases damage taken by your opponent from enemies by 15% for 120 sec., And your opponent's and party's damage to opponent for 16 sec by 25%. The effect of reducing the resistive rate of the critical strike has been changed as follows. We have changed the 'chord enhancement' tripod effect as follows. Change: Damage to enemies increases by 100%. The "Protection of Light" tripod effect has been changed as follows. Existing: Reduces 50% of damage done during Light Cyclone and 75% of damage done by party members within 3 seconds. Change: Reduces damage to enemies by 50%, reduces damage done by 50% of light damage, 75% damage for 3 seconds, and absorbs 10% of maximum life . Existing: Damage to enemies increases by 80%. The effect of the 'High Speed ​​Shot' tri-pod has been changed as follows. Existing: Reduces the number of attacks by 1 and increases the cooldown by 6 sec. However, it can be changed to Chain Skill twice, which increases the pushing distance by 40% and the damage done to the enemy by 150% . Change: Reduces the number of attacks by 1 and increases the cooldown by 6 seconds. However, it can be changed to Chain Skill twice, which increases the push distance by 40% and the damage done to the enemy by 200% . We changed the 'concentrated saturation' tripod effect as follows. Legacy: No redirection, but a 50% reduction in duration and a 250% increase in enemy damage. Change: No redirection, but a 50% reduction in duration and a 300% increase in damage done to enemies. The machine gun attack has been changed so that it does not cause stiffness during PVP. The missile attack has been changed to cause stiffness only to the target during PVP, not during skill casting. We changed the 'Robustness' tripod effect as follows. Existing: Skill-in-use state immunity is applied. Alter: Immunity is applied when using Skill. 'Kal Eligos' minimum entry item level is 'above 545'. In 'Kal Eligos' you can acquire 2 ~ 4 randomly assigned new necklace accessory items. I added the Quest for 'Cal Eligos' Investigator. We have added a request for 'Eli Gos' during the week. We added 'Carl Eligos' to the milestone. We added 4 kinds of quests related to 'Kal Eligos' and 2 titles. ■ Added "Song of Return", which allows you to go directly to a registered return location even from a remote location. You can learn 'Return Song' through 'Quest [Return]' quest after 'Quest Kingdom' is completed. You can meet the nephew Shannon, who started the quest in Lucerne, Bern, Roarun and Sternen. You can move to the saved place when playing the 'Return Song'. The return location can be specified by touching the "Statue of the Return" placed in the four major cities of Lutheran, Bernese, Roarun and Sternen. The designated return information can be found in the song description of the return in the score window (F2). The waiting time for re-use song is 2 hours. The return function can be used during navigation. ■ We have added the Party Search function so that you can recruit or participate in parties more conveniently in various places. You can open the Find Party window by clicking the shortcut icon [;] or the Quick Menu (Find Community - Party) or the Find Party icon in the Game menu (ESC). 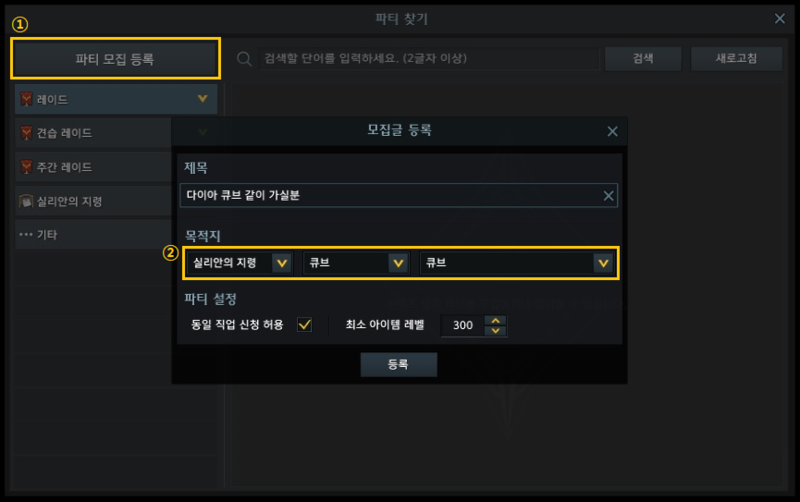 In some areas, the Party Find feature is not available, and when you enter the region, party recruitment and participation may be canceled. You can check the progress of finding a party through the flag icon in the top notification. If you register your application, you can check the number of users who subscribed to the registered article. If you apply, you can check the application progress information. The Find Party button on the existing raid board has been removed due to the addition of the Find Party Board. You can register the party recruitment in the desired category by clicking the 'Register Party Recruitment' button at the top left of the party finder window. You can set up your destination and choose the content you want to recruit for the party. If your desired destination is not listed, you can use the "Other" category. You can set whether or not to apply for the same job as the minimum item level when enrolling. During the party recruitment, you can check the recruitment information by clicking the 'Recruitment Information' button at the top left of the party search window or the flag-shaped icon to the left of the mini-map. You can check the information of the character you have submitted in the recruitment letter you registered, and click "Accept" to join the party. If you want to change the setting of a party, you can change it in the offer information window. If you press the "Unsubscribe" button, the party recruitment will be discontinued. If the recruitment is completed or aborted, the recruitment will be deleted and any remaining entries will be automatically rejected. After selecting the items by category, you can browse the list or search for the desired party recruit using the search function. You can see the details of the party you selected when you click on the party recruitment post. Participation can be done only for one party, and previous participation will be canceled when you join another party. After the application, the party party of the party accepts the party and joins the party. If the party chairman of the party you are applying for has not accepted, you can cancel your application at any time by clicking on the 'Cancel' button. We changed the 'avatar' warehouse to the 'equipment / avatar' warehouse. You can now store avatars as well as equipment in your warehouse. We have changed the attribute of 'Sea turtle al' item that can be obtained from small lucky island to a miscellaneous. We have changed the guideline of the monster below the boss that was displayed in the item acquisition point information as shown below. We have unified the item quantity notation of the rune mounting UI in the same way as other UI. Item tooltip set Indentation applied to the guideline. Lost Arc Shop's Tier 1 High-Speed ​​Growth Package and Tier 2 High-Speed ​​Growth Package have been changed to units of expedition. After using the box items, the items of the acquired items are the same as before. We have been modified to receive mileage according to the amount sold at the time of the sale of Royal Crystal at the currency exchange. After your Royal Crystal sale has been completed, you will be able to receive your mileage in the Deal Results box. Mileage for Royal Crystal, which was sold in the past, was paid back in bulk during the 4/10 (Wed) regular inspection and added to existing mileage. We have added a separate loading directive in the transaction result box of the currency exchange when the payment is received when the money is received. Raid 'Dark Fog Ridge' has been modified to make it easier to explore the raid map by adding a movement route. Reid 'Dark Fog Ridge' has been modified to prevent the Guardian from appearing in some areas as the route is added. The effect of 'Sand Curse' in 'Sandstorm' of 'Raider Guardian' Taitalos is adjusted as follows. It has been modified so that it will not be removed by debuff removal effects such as 'Sacred Amulet' or 'Nellathia's Aura'. Fixed a "curse of the sand" to occur even when you are in 'immune status'. Rev Boss 'Revanos' has been modified to prevent provocation when trying to regenerate a site. Proof battlefield The pre-season before the competition has ended. Pre-season reward for each pre-season will be paid by post. Pre-competitive hot-time information displayed on the calendar has been removed. Pre-competition requests are excluded from weekly EPCO requests. We have added three kinds of lootable auction items that can be acquired at 'Ikaraya', which appears in Blue Hole Island. Existing item drops remain untouched and trophy auctions are added. 'Attack II', which can be obtained by the auction of 'Ikaraya', can not be traded like the basic assignment of the item. Field boss on Blue Hole Island The boss 'Ikarya' has been modified to produce a random spell at random points within a certain range when using the pentacle skill. We have downgraded the number of vines in the shipwreck. The speed of some transporter of Mureungdo circle improved. When two or more people played the Mureung flower in sequence, the mureung flower was already full, but it was full again, and the phenomenon of dropping the dew items of mureung flower was corrected. The monkeys appearing after the completion of the resurrection of the stone monkey have been modified to look better. Changed the notification time from 1 minute to 3 minutes before Mureungdo Island. We have added motion that is gradually destroyed on the seal rock of Mureungdo circle. Improvements have been made to better show the vehicles that arrived near the station. 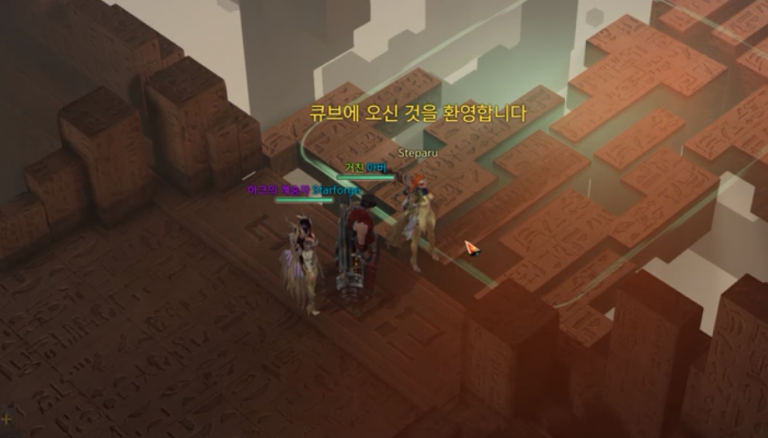 Mureungdowon 'a drink to awaken the road' quest, the Mureung flower at the previous stage to prevent it from appearing beforehand. Surawo Story Mission 'Greater Beautification Arena' The field of view of Gangun was shorter than other difficulty, so we adjusted the field of view. Modified to prevent the sleeping effect of sleep bombs from being invulnerable immediately after being resurrected using the feather of resurrection after death on PVP-enabled island like the outlaw island. We improved the direction when applying the party buff effect through some skill and the tripod. We have expanded the UI size so that 6 lists are displayed on the score interface. Alignment rules are reflected so that the score that you have in the score list is printed at the top. We have changed the display rule of wait time for performance replay to display in the form of minutes = m / second = s.
You have modified the navigation UI to call the F2 key in the navigation map. We added the score (F2) menu to the adventure category of Quick Menu and Game menu. Lonely Island Opper NPC 'Baoyom' and bargain on the exchange of items to be sorted by the type of exchange has been changed. Handel 'Palace of the dreams [hard]' Chess room to enter the trap is adjusted to match the difficulty. We have modified the display of the performance area so that we can more accurately see where the target of the 'Crying Storm Cleanse' quest is located. We have added a guide to guide you through the raid map when you visit the healing sanctuary in the quest 'Faceless Gentle'. The handbill of the chess board, given by the boss 'Monghwansong Knight', appeared in the Handel Dungeon 'Palace of Dreams'. Adjusted to acquire accessory items after reaching the minimum recommended item level of the secret map. Attendance compensation will be renewed after regular inspection on April 10th. It has been improved so that warning system messages of adventure books and musical instrument playing are printed only once every 2 seconds to prevent excessive output. We've added a message to help you identify some ineligibility reasons for goodness-of-action and compensation. Fixed the issue of frame rate dropping when there are many objects with tagged names. Expanded the mouse clickable area of ​​the integrated character library button. Fixed the phenomenon that when a character caught by a monster gets caught by a character and a movement path overlaps with that character, movement is unnatural. When the death of Raid Guardian 'Belganus', we corrected the phenomenon that the color of the body seen in actual body and directing is different for a while. 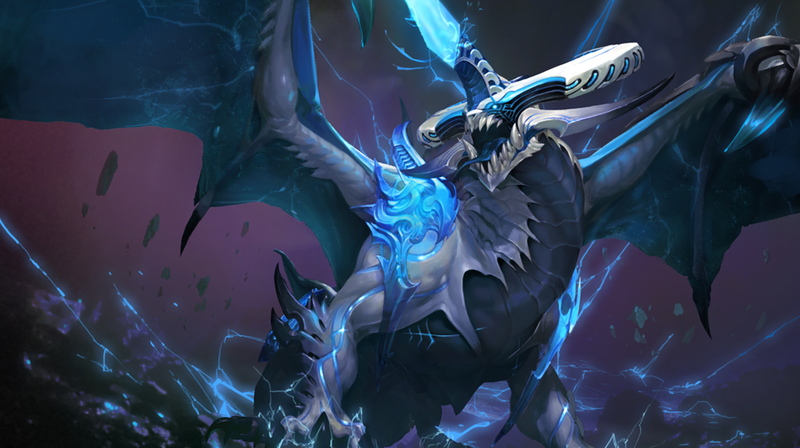 Raid Guardian 'Buganus' has been changed to 'Flight Bomb' when it is not in the correct position. Raid Guardian When he succeeds in subjugating the Guardian with Berthus being caught, he has fixed a phenomenon that makes it impossible to manipulate the character with a low probability. Chaos Dungeon 'Memory of the Moon' in progress, the boss before the space is not effective in the phenomenon has been fixed. Fixed a problem where you can not talk to Aven in quest of 'Magical Runaway' quest, which is handled by Handel. Fixed the phenomenon that when using the spinning skill of the monster 'Dadaan' that appears in the hillside of the Eduacalanto Hills, it was intermittently placed outside the skill range. Fixed the phenomenon of being moved to a place where it is impossible to move due to a hit of a monster during the process of 'Hive North's Arena' in the quest quest of Hive North. Shushaire 'Baiden's Hideout' has been fixed in the process of attacking monsters beyond the wall. We changed the position of the elite monster placed at the entrance of the "mountain lair" of the Antsu continental "lane hill" to flat. Fixed some pet attacking traps. Warrior Prologue Bug Monster 'Yegati' in battle Yegati has jumped to the wall, and when he is disabled, he fixes a problem where Yugati's appearance remained on the ground. Blue Hole Island Field Boss 'I Arcana' skill 'Oh Mang Sung' has been modified to damage the bottom when the monster dies. Blue Hole Island Field Boss 'Arcane' Skill 'Oh Mang Sung' center point is not created in a random area, but the character is created where the character has been corrected. Corner of Trials Fixed a problem where a monster does not attack a character if the character is located at a specific location. Bard identity 'Serenade of Salvation' skill's cooldown time varies depending on the number of bubbles it holds, but the tooltip does not display the corresponding item. Fixed the problem that the duration of 'Endless Guardian' does not apply normally when applying the 'Sharp Guardian' tripod of the Bard 'Guardian of Play' skill. Bard 'Heavenly Play' skill 'Heavy Playing' has changed the tri-fold icon to match the effect image. Bard 'Sound Hellic' skill 'Concentrated Saturation' has been applied lower than the intended effect of the tripod has been corrected. Bard 'Death's Prelude' skill 'Death's Amplification' and 'Aria of Death' are not applied intermittently. Fixed the problem that the damage of Summoner 'Flying Bird' was applied lower than intended. Corrected the phenomenon that the cooldown time of the chain skill 'Pauru-Flame Breath' is applied at the time of skill input when applying the 'Blue Flame Paaru' tri-pod of summoner pet 'Pauru'. Fixed the phenomenon that the 'Tough Fort' effect of Hawkeye 'Cremora Mines' skill is applied differently from tooltip. 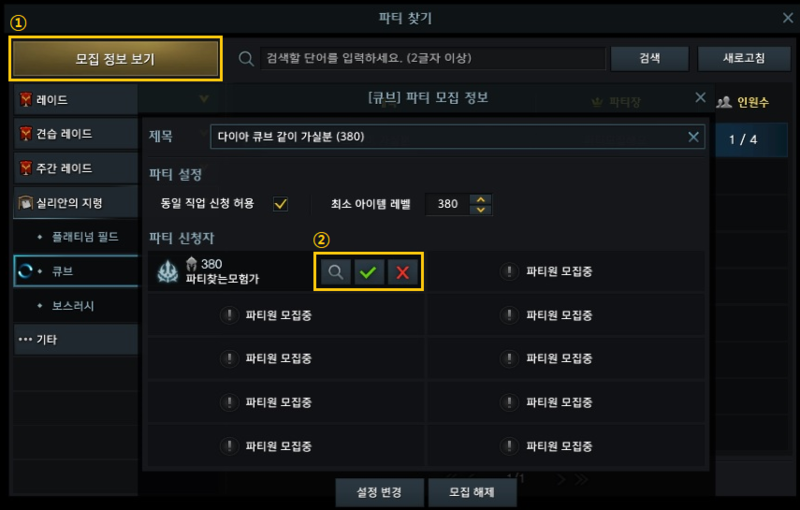 Hawk Eye 'Atomic Arrow' skill is not able to change the abrasive effect in 'arm, head' armor but it has been fixed in 'Convertable abrasive effect list'. Fixed a problem that incorrectly states what effect the tooltip will increase when applying the Arcana Pocard 'ForceTac' Tripod. Fixed a problem in which the Arcadia does not work with the Quickdroke Tripod when equipped with an immune rune. Fixed the 'successful change' trio effect of mechanics 'poison bonus' skill does not apply to more than a few states, so that the damage is increased to all enemies in abnormal state. Fixed the attack speed increase to be applied normally when applying the 'Hodo's Hunch' Tripod, which is the skill of the Technician. The Berserker 'Mountain Crash' skill 'Quick Preparation' and 'Seismic Wave' triopod have been modified to apply 'Quick Preparation' effect to 'Seismic Wave'. Fixed a problem where the tooltip value in character information is displayed incorrectly when applying a damage reduction buff. Fixed the phenomenon that some engraving effect does not work intermittently when moving map such as local move or contents entry. Corrected the phenomenon that, when applying the 'Shield penetration' effect, the amount of damage exceeding the shield is amplified and applied. Fixed the problem that the linkage effect is displayed abnormally in the character information window (P) when the rune is attached to the rune amplification slot. Fixed the phenomenon that context menu of other character is displayed when context menu is opened in progress information window of 'Silmael Battleground' Guild Wars'. Fixed a problem where ranking and total information was changed on the pre-competition ranking board. Fixed the phenomenon that 'Sentence of victory' which is in effect is not marked when re-matching application is applied after the end of battle of proof. Proof of the battlefield In the pre-competition ranking board, the phenomenon that the rank change icon overlaps with the text has been corrected. Fixed the problem of '$' being displayed in Ranking UI when checking the ranking of the Sila Mael Battlefield without the guild being in the group. Fixed an error that unnecessary 'giant mushroom stems' items were duplicated in large mushroom island mushrooms. 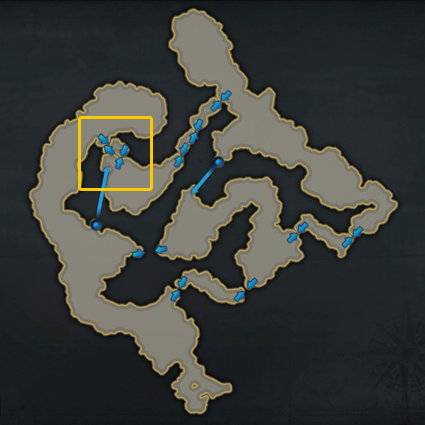 Corrected a problem where the completion phase of Orbis Island quest 'Cheonha Il Mi Pumpkin Search' was incorrectly marked as another area. Fixed a phenomenon in which a lucky reed island competitor quest 'Hidden in a Reed Forest' was in progress, and the character was not hit and the box could be obtained without fighting. During the quest 'Eto's worries' of the dreaming gull island, we corrected the phenomenon that only the tree bottom can interact at the stage of cutting the tree. Fixed a phenomenon where a character is trapped in a certain position of a dreaming gull island. Dreaming Seagulls Fixed a phenomenon in which a seagull in a specific location on an island appears to be sitting in the air. Totoike Quest in the scent of the sea, 'transformed into Mococo!' Fixed the phenomenon that the character temporarily goes down and goes up on the presentation screen displayed during the process. As a result of the rainbow cloud bridge in the harbor of the Handel continent 'Silver Ripple Lake', the direction of entering and exiting from the environment directing has temporarily corrected the unnatural phenomenon. Fixed the situation where other locations are temporarily displayed on the mini-map while entering the secret space at Mureungdo circle. Fixed the problem that when you click the mouse while pressing the Alt key while the navigation is automatic, the automatic operation stops at that point. Fixed the problem that the character arriving at the destination after boarding a regular line is displayed at an abnormal position. Awakening Quest '[Awakening] When your friend's resolution' is in progress, we have fixed a situation where you can not proceed with another quest of Shilian. Lutheran Harbor Quest 'to the sea!' Fixed the phenomenon that the ship and the background overlap when first entering berth mode after completion. 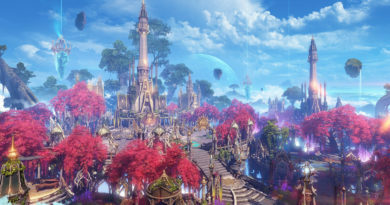 If the game ends at the time of acquisition while interacting with the seeds of Moco, the seeds of Moco are shown as being acquired, but the achievement of the expedition 'Seed Seeker' is not achieved. 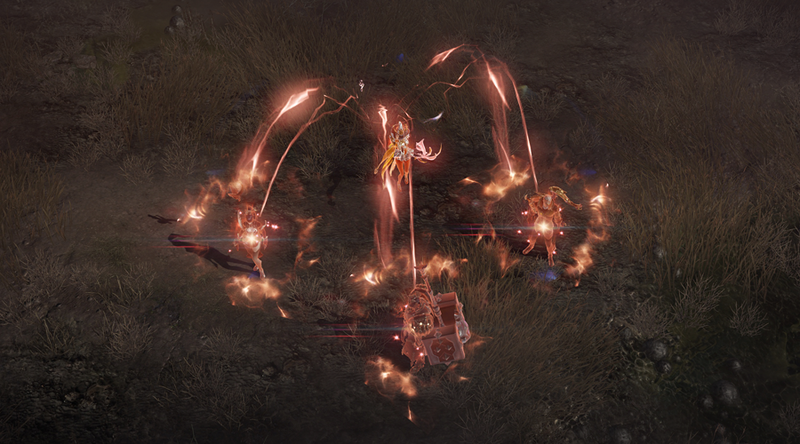 Devil Hunter When using the 'Clay Bombing' skill, the expeditionary achievement 'Shine a firework dance!' Corrected the phenomenon that the count decreases intermittently. Corrected the phenomenon that the awakening phrase "Tera Break" is missing from the explanations of the expeditionary achievement "Master of Gravity". Fixed the phenomenon that the Achievement Condition Skill 'Sicmic Hammer' is incorrectly displayed as an awakening in the description of the Expeditionary Achievement 'Destroyer of the Earth'. We have changed the achievement description of "Expedition of Island Island" from "Acquisition" to "Return". 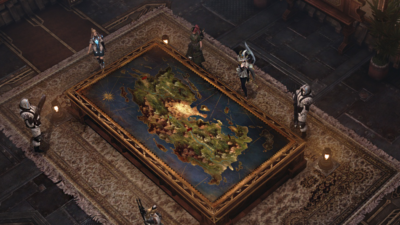 We have changed the achievement description of the expeditionary achievement "This is ... good!" To make it easier to understand. Fixed the "Mystery of the Labyrinth Loot Item" item that was available during navigation. Fixed the phenomenon that the 'Open' button of the box to randomly acquire items appears to be inactive with low probability. Corrected the phenomenon that the item 'Orbis Island's Heart' item was not output to the Expected Compensation Exp. Fixed the phenomenon that items made on island do not guide related NPC location in 'Recipe Favorites' and 'Item Processing Information' window. Fixed a situation where random opponents of 'nine tail' ring 'ring in tooltip and detail information are not exposed when viewing information of other characters in a distance or other area. In the milestone, when the information of the field boss 'Tarsilla' is confirmed, the phenomenon that the 'additional plant damage rune' is registered in the recommended rune has been corrected. Fixed a problem where the 'third' effect (minus) was not displayed in Ability Stone's tooltip. Fixed the phenomenon that sleep effect is applied when 'sleeping bomb' is used to the enemy who became invincible immediately after resurrection. Fixed the phenomenon that the legendary grade and the background color of the relic grade intersect with each other while character conversion is in progress. Corrected the phenomenon that other item information is displayed intermittently when checking the item list on the left side while polishing the item. Songs of Remembrance 'Song of Recall' Corrected typographical errors in the acquisition tooltip description. Fixed 2-Tier Legend Dungeon Equipment 'Shadow of Dreams' equipment, Battlemaster, Infector, and Armor icon errors. Handel 's Scent Hill' Quest of the Lurking Nymph 'quest is now underway Sometimes the player has been caught in the' Sommoongchi Flower Tree '. Fixed a phenomenon in which characters intermittently get stuck in a specific terrain of Artemis' Base. Corrected the phenomenon that 'Confirm abrasion' button is displayed as 'textField' in polishing UI. Fixed the problem that the afterimage of the quest completion message is continuously exposed at the top. Fixed the problem that heart symbol of favorable item is not displayed intermittently in box open result window. Fixed the problem that the mouse scroll function of the window UI does not work like the combat skill window (K) while using the item tooltip extension key (Alt + mouse wheel). Fixed the problem that when the monster jumps after taking the target designation smart ping, there is no smart ping mark movement. Fixed the phenomenon that the surrounding objects appear to disappear when the character moves to a certain position in the 'Totre Rite Market'. Fixed a problem where the burn effect of a particular candle object placed in the northern Rania town would appear to be floating in the air. Fixed the phenomenon in which the color around the armpit is discolored when the avatar of the martial arts class is wearing 'avant-garde emotional image' avatar. Life-making equipment "skillful fruit top" When the avatar is worn, the phenomenon that the faint line appears on the right shoulder has been corrected. Fixed the problem that weapons only appear in black in character info window (P) when worn bard avatar 'Guardian's last riana harp'. Fixed the problem that the effect is shaken or does not print properly during card battle. Fixed the phenomenon that the card reception button is activated intermittently even though the card to be received in the integrated card storage box is not selected. Fixed the problem that when dragging a card registered in the integrated card holder, the image of the card is also dragged. Fixed the phenomenon where you can see a party that does not have a party party in the 'Details' section of the Find Party window. Fixed the problem that the character that is being loaded does not output a message that the existing party member rejected the automatic party. When reconnecting in the same zone after content termination, the phenomenon that the party that met by matching even if the zone is destroyed is fixed. Fixed a problem where system error messages are displayed when a party member is unable to enter the battleground during the battle of the battlefield and the battlefield match. Some of the texts that are misrepresented as 'undead series' have been changed to 'non-series'. Fixed the phenomenon that the product is not seen intermittently when clicking on the product box after purchasing the item in the Lost Arc Shop. ça deviens quoi tout sa? elle sortirons jamais? une date de prévu pour une grosse maj avec potentiellement des news classe? (genre new arc ou connerie du genre?) ou alors trop de mal à équilibré ceux présente pour les sortir? Aucune nouvelle pour les prochaines classes non. Elles sont sans aucun doute toujours d’actualité, mais aucune idée de leur date d’arrivée. 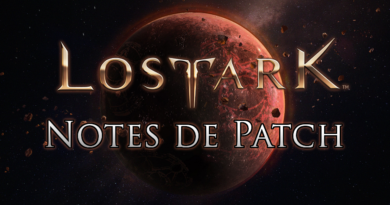 Après nous sommes toujours en phase d’OBT, ils prévoient peut-être une sortie pour la release officielle du jeu !